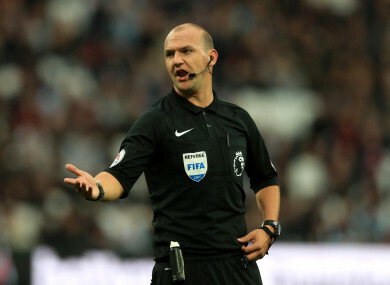 PREMIER LEAGUE REFEREE Bobby Madley was sacked for ‘sending an inappropriate message’ on Snapchat, according to reports in the UK. Two weeks ago, it was confirmed that Madley was to step away from refereeing with immediate effect. However, both Neil Ashton of SunSport and Sky Sports have reported today that Madley was indeed sacked for misconduct when his inappropriate Snapchat message reached a Premier League official. The 32-year-old is alleged to have suggested in this message, which contained a picture of a disabled man, that he would likely beat the man in a race. Referee Madley was on a six-figure salary and is understood to have moved to Norway following his reported dismissal. Email “Premier League ref Madley was reportedly sacked for making fun of disabled man on Snapchat”. Feedback on “Premier League ref Madley was reportedly sacked for making fun of disabled man on Snapchat”.